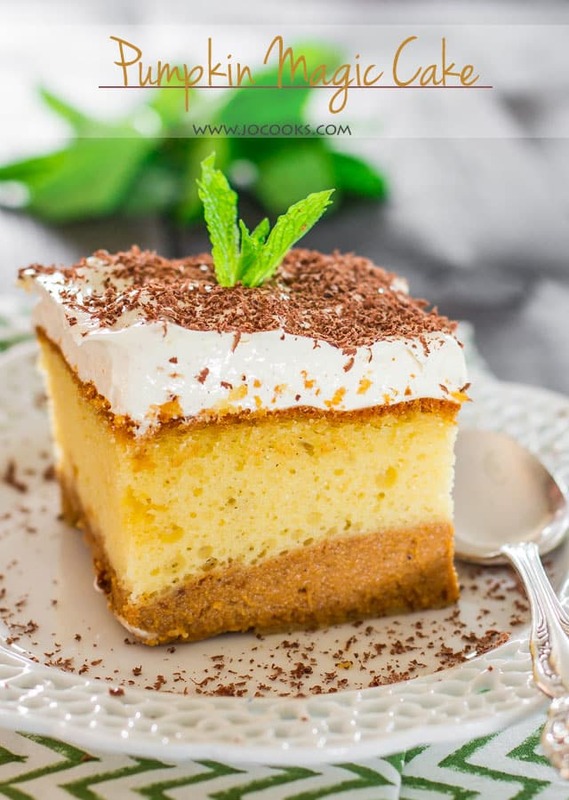 Pumpkin Magic Cake – the magic is in the batter as it separates during baking, creating 2 beautiful layers. To finish it off, top it with a pudding frosting. My love of magic cakes has brought me to this moment. Although this is not your traditional magic cake, it’s still a magic cake. But what makes a cake magic is the fact that the batter separates into layers, all on its own. And through my pinterest browsing endeavours I have found this marvel of a cake. But at the risk of sounding overly dramatic, this cake truly is the mother of all cakes. That’s if you like pumpkin. I, for one, love this time of the year for one reason and one reason alone. And that’s not the weather, my friends. It’s the food, the pumpkins, the vegetables, and all the colors. Colors of leaves, colors of vegetables, but it’s definitely not the weather. Although, as a little side note, we have recovered from our summer snow blizzard last week. The polar vortex had put the city of Calgary in a winter wonderland for a couple days with about a foot of snow. Not to mention the thousands of fallen trees. But yet here we are this week, with beautiful sunny summer weather. Weird, or what? 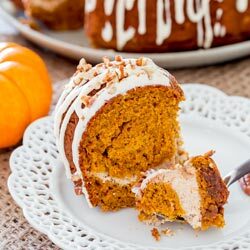 Pumpkin Bundt Cake with Cream Cheese Filling – a delicious bundt cake that tastes like pumpkin pie, with a lovely cream cheese filling then drizzled with a nummy cream cheese icing! I’m going to start by telling you how simple this cake really is. But there is a caveat, and that is you do have to wash your mixer bowl 3 times. However, it’s all worth it. You start out by making a simple yellow cake, using yellow cake mix. Pumpkin magic cake is a a cake with a layer of pumpkin. 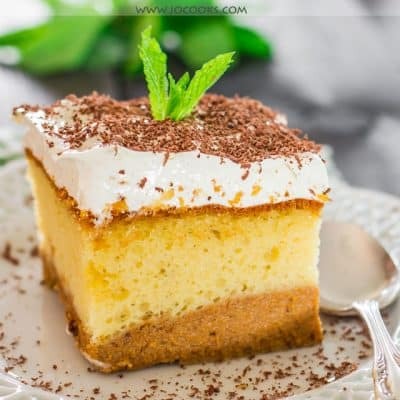 The magic is that when you make it, the pumpkin layer is on top and as it bakes the layers shift and you end up with the cake layer on top and pumpkin layer on the bottom. You just make the yellow cake as you normally would, add eggs, oil and water or milk. Pour it in a baking dish, but don’t bake it yet. Next comes the pumpkin pie part. All you need are a few ingredients. Canned pumpkin, heavy cream, evaporated milk, eggs, brown sugar and pumpkin pie spice. Then you slowly pour this pumpkin batter over the cake batter, but DO NOT mix. Just pour it over, slowly. Bake it for about an hour, during which time your house will smell insane. I made the cake yesterday after work, and since it was already late, I didn’t frost it till today, because the cake hadn’t cooled properly. So all night I kept smelling this cake in the house, almost made me cry, since I couldn’t have a slice. When you take the cake out of the oven, you may think that the cake hadn’t separated, but don’t be fooled by the color of the top of the cake. The pumpkin layer is hiding nicely at the bottom of the cake. Let this cool completely. But you know what my favorite part of this cake is? The frosting! We’re talking vanilla pudding, Cool Whip and pumpkin pie spice. And you know what else? It’s the bomb! I love pudding type of frostings because they’re not gross like those buttery frostings. Oh, this cake, my friends, is simply divine! Pumpkin Magic Cake - the magic is in the batter as it separates during baking, creating 2 beautiful layers. To finish it off, top it with a pudding frosting. In another bowl whisk together the ingredients for the pumpkin pie until smooth. Slowly pour the pumpkin pie mixture all over the cake mix. Do not mix. 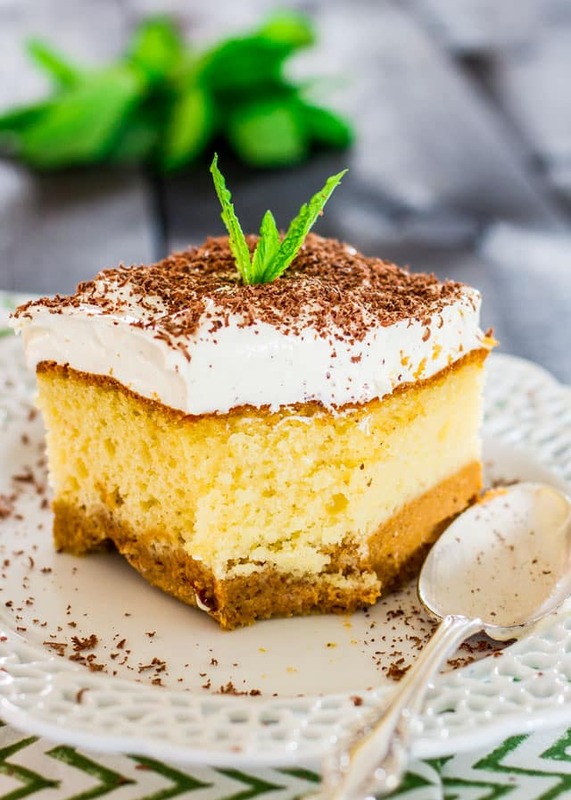 Carefully place cake into the oven and bake for 50-60 minutes or until the center is no longer jiggly, and a toothpick inserted into cake mix comes out clean. NOTE: The cake might be slightly darker than normal so don't worry, it's not burnt. Let cool to room temperature. While the cake is baking, make the frosting. Place the vanilla pudding mix into a large bowl, add the pumpkin pie spice and pour in the cold milk. Whisk until combined and starting to thicken. Gently fold in the Cool Whip until it's completely combined. Spread on top of the cooled cake. Serve it now or chill the cake for a couple hours. Feel free to replace the cool whip with regular whipped cream if you wish. If preferred, shave some chocolate and top the frosting with it for a bit of chocolate flavor. I cant wait to make this!!!! This dessert was excellent and will be made again! 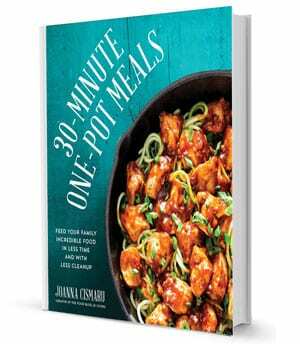 I love your site Jo and it is nice to have new recipes to try! Thanks, Becky! 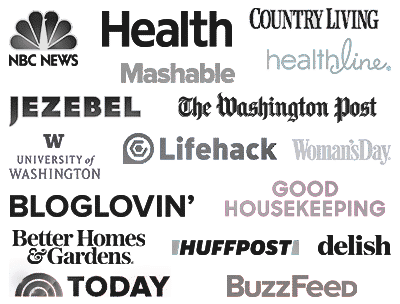 So happy you’re enjoying my blog! My godson asks me to make this for his birthday every year. We all love it!!! Fabulous!! Made it for book club and we all loved it. I did use real whipped cream and it was delicious! 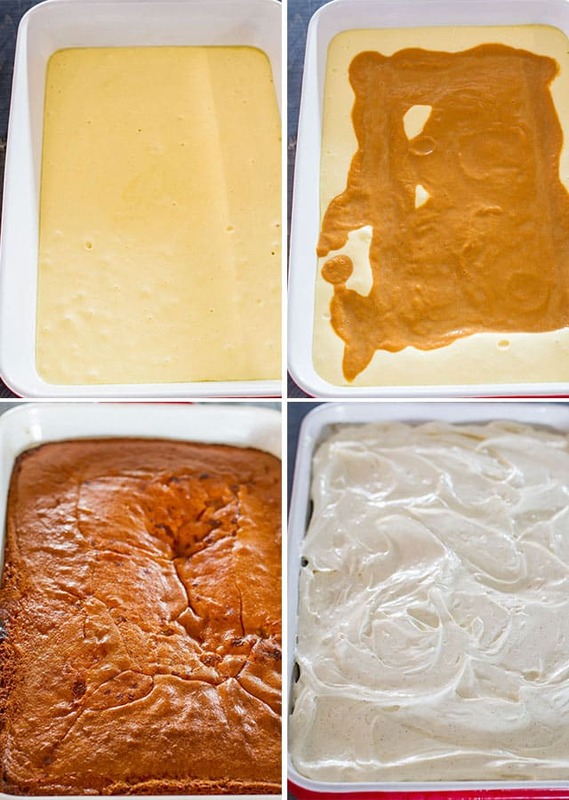 According to the picture, it looks like the pumpkin pie mixture is the bottom layer, but according to the recipe it says the cake mixture is the bottom layer. Please clarify. You are correct on both counts, if you read the post you’ll see that’s the magic of the cake, the layers invert as the cake bakes. I would I make this in 2 pans? I love this cake ….. every one loves it … but I changed cause I love pumpkin so much … I use spice cake mix ,,,,, and pumpkin spice pudding ……. its really good no matter how u make it … thank you so much for sharing it . Jo, Your recipes are great! I look forward to making them when I get them you are a gifted cook. Thank you so much. Hi bakers… hey I want a fresher, non cool whip frosting. What other things have you done? I mean I could just make some whipped cream, but I think it might be too heavy. I just don’t like how cool whip tastes. Any and all ideas would be appreciated. I could just use whipped cream by itself. You could just make a butter cream frosting. 3 cups of powdered sugar, 1/3 cup of butter, 1 and 1/2 tsp. vanilla extract and about 3 or 4 tbsp. of milk. Mix altogether and spread on cake. I suppose you could substitute pumpkin spice for the vanilla, but I think the vanilla might compliment the pumpkin cake. WHAT ARE YOU GRATING ON TOP OF THE FROSTING?? You do, there’s a print button right under the image in the recipe. Could I substitute the heavy cream with coconut milk or coconut cream? Can I make this in two round cake pans instead of square pan? Hi Linda, I’m not sure, I just tried it myself and it worked. You could try a different browser, or simply copy the recipe and paste it in a word document and print it from there. Sorry for the inconvenience.